As explained at its outset, the “Q” in the “HaaretzQ” conference stands for questioning, and all of the panel discussions were framed in the form of a question being addressed by the speakers. HaaretzQ was the joint creation of the left/liberal Israeli newspaper, Haaretz, and of the human-rights funding nonprofit organization, the New Israel Fund. Over a thousand people attended, with hundreds reportedly on the waiting list, at a midtown Manhattan hotel, Sunday, Dec. 12th. It’s the latest in a long tradition of ambitious values-oriented political conferences that liberal and left-wing American Jews have conducted and participated in since the 1970s, including New Jewish Agenda, Tikkun, the Shalom Center, the Workmen’s Circle, the New Israel Fund, and in more recent years, J Street. 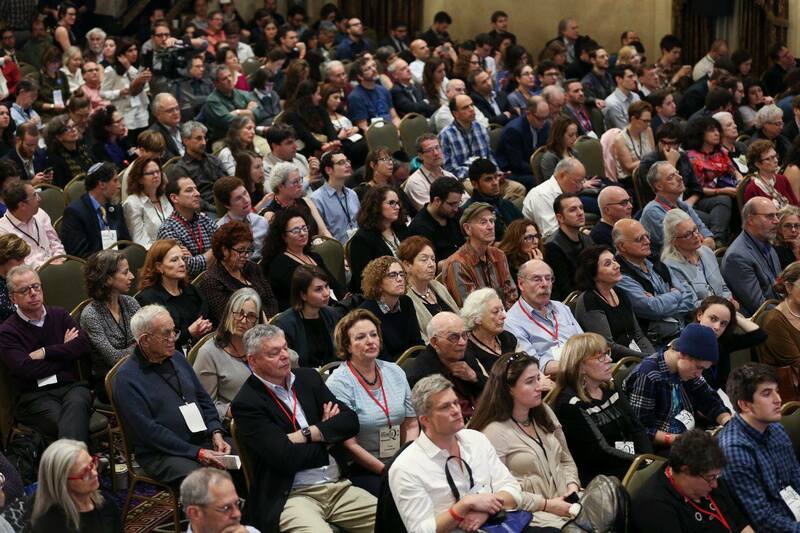 Like most of these conferences, HaaretzQ provided an embarrassment of riches in a dizzying array of sessions on offer, including most in simultaneous “breakout sessions” that presented participants with the dilemma of having to choose among intriguing alternatives. Haaretz has helpfully posted a summary of sessions online. And the New Israel Fund has posted videos of the highest profile speeches plus photos like the one above (click here). It began with a video greeting from Pres. Obama and speeches from three prominent voices across a spectrum of opinions and interests: Pres. Reuven Rivlin, PLO secretary-general Saeb Erekat and Zionist Union co-leader Tzipi Livni. Rivlin and Livni both have family roots in the right-wing Revisionist movement and spoke from the heart, with Rivlin acknowledging that the audience did not agree with him on some issues. Livni spoke of her concern some years ago that her change to a more dovish and liberal perspective would hurt the feelings of her elderly mother. Yet both speakers commented somewhat critically on the presence of the Israeli NGO, Breaking the Silence, at the conference, and both defended soldiers of the IDF as fundamentally moral in outlook and deed. Breaking the Silence highlights what it views as the corrosive nature of the occupation of the West Bank on Israeli society by publishing the testimonies of soldiers, mostly anonymously. Abuses like looting and the destruction of Palestinian property, it argues, have become the norm. . . . But Rivlin’s very appearance at the conference has drawn right-wing criticism, as the New Israel Fund has for years been subject to vilification for providing grants to such human rights NGOs as Breaking the Silence; and Haaretz is likewise viewed with suspicion (to put it mildly). I was puzzled and amused when the Israeli flag was carried off the stage as if it were part of a patriotic demonstration following Rivlin’s speech. I later discovered that it was in deference to Erekat’s demand to not appear in the presence of an Israeli flag. This struck me as similar to MK Ayman Odeh’s insistence on speaking to the Conference of Presidents at a location visibly apart from the Jewish Agency; both demands were surely as troubling to most Zionists as this kind of symbolism is problematic to Palestinians. It’s sad that relations have so soured with the PLO that one of its leaders would insist on such an action. Erekat elicited unanimous sympathy and some shock when he revealed that his nephew was killed the week before at a West Bank checkpoint. During a later panel, another PLO participant shut down moderator Aluf Benn (the Haaretz editor-in-chief) when he had tried to interject the circumstances of his death, with the IDF claiming that he was killed while attacking soldiers. I was most interested in the closing plenary, however, with speeches by the American Ambassador to the UN Samantha Power, and the head of the Joint Arab List in the Knesset Ayman Odeh, followed by an engrossing conversation between journalists Peter Beinart and Ari Shavit. Click here for Part 2. . . This entry was posted in Israel, Letters From Leadership, Letters from the Leadership and tagged Breaking the Silence, Haaretz, New Israel Fund, Reuven Rivlin, Saeb Erekat, Tzipi Livni. Bookmark the permalink. I’m really inspired together with your writing talents and also with the layout in your weblog. Is that this a paid topic or did you customize it yourself? Anyway keep up the excellent quality writing, it is uncommon to peer a nice blog like this one nowadays..
Hi my family member! I want to say that this post is awesome, nice written and come with approximately all important infos. I¦d like to look more posts like this . Thanks, I have recently been looking for info about this topic for ages and yours is the best I’ve came upon till now. However, what concerning the bottom line? Are you sure concerning the supply? Its like you learn my mind! You seem to understand a lot about this, like you wrote the e book in it or something. I think that you just could do with some p.c. to pressure the message home a bit, however instead of that, this is great blog. An excellent read. I’ll definitely be back. Attractive component to content. I just stumbled upon your blog and in accession capital to say that I acquire in fact loved account your blog posts. Anyway I’ll be subscribing to your feeds or even I achievement you get entry to consistently fast. I carry on listening to the reports lecture about receiving free online grant applications so I have been looking around for the top site to get one. Could you tell me please, where could i acquire some? It’s a pity you don’t have a donate button! I’d definitely donate to this excellent blog! I suppose for now i’ll settle for book-marking and adding your RSS feed to my Google account. I look forward to brand new updates and will share this website with my Facebook group. Chat soon! I think this website has some rattling good information for everyone. “Only the little people pay taxes.” by Leona Helmsly. Aw, this was a really nice post. In thought I wish to put in writing like this additionally – taking time and actual effort to make a very good article… but what can I say… I procrastinate alot and under no circumstances appear to get something done. Great post. I was checking continuously this blog and I’m impressed! Extremely helpful info specially the last part 🙂 I care for such info a lot. I was looking for this certain information for a long time. Thank you and good luck. Thank you for some other informative site. Where else may just I get that type of information written in such a perfect means? I’ve a project that I’m just now running on, and I have been at the look out for such info. Thank you for another great article. The place else may anybody get that kind of information in such an ideal manner of writing? I have a presentation subsequent week, and I am at the look for such info.